This soup is perfect for cold, sick days or as a low calorie soup option. 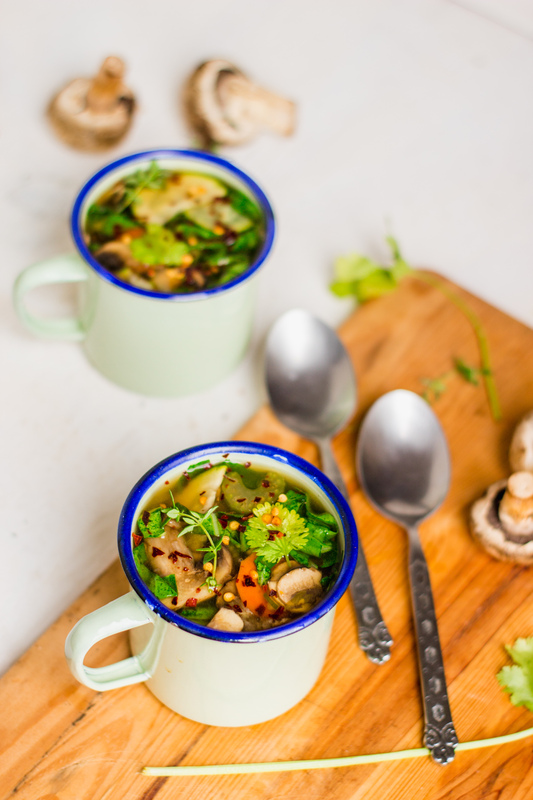 Full of healthy vegetables and all the wonderful health benefits of broth in one delicious soup. Easy to whip up and who doesn’t love a good slow cooker recipe?! Preheat oven to 400°F. Place beef bones, carrot, onion, and garlic on baking sheet, toss with garlic infused coconut oil and roast for 45 mins stirring the pan every 15 mins. Place roasted bones and vegetables into a slower cooker along with celery, bay leaves, thyme, chadon beni and apple cider vinegar cover the ingredients with water 8-12 cups and allow to slow cook on high for 6 hours and another 6-10 hours on low. After cooking for 12- 16 hours drain broth and allow to cool and then skim the fat off the surface. In a large soup pot on med- high heat, add coconut oil and sauté onions, garlic, celery, carrots and chili flakes for 5-6 mins. Add the remain ingredients except pak choi and allow to simmer for 15 mins. Add pak choi and allow soup to simmer for a further 5 mins. Taste for salt and pepper and adjust accordingly, serve hot.